The launch of Edinburgh Plant Science held at the Royal Botanic Gardens Edinburgh was a fantastic afternoon of talks from a wide variety of collaborators. The event served as a real eye-opener into the diverse range of plant research that is being carried out here in Edinburgh, from molecular biology research to future agricultural security. I caught up with some of the speakers at the drinks reception to find out their thoughts on the launch. Karen Halliday, EPS Director, described the launch as “very successful!” She was pleased that everything went to plan, and remarked that the student session was a particularly big hit and really great fun. The launch received very positive feedback by all who attended and those who were unable to attend were sorry to have missed it. I asked Karen what the future holds for EPS, now that we have officially been launched. 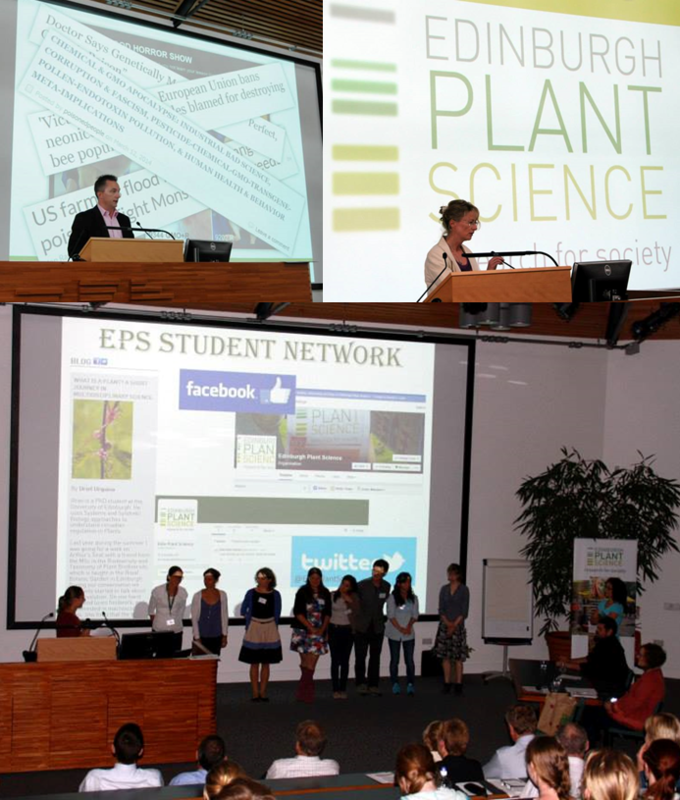 There are already lots of plans in place for EPS, including setting up an advisory board to bring all of the partners together and facilitate decision making, a monthly debating series to discuss the impact of plant science on society, hot house meetings to create a new funding initiative and the introduction of EPS Global studentships to enable students from developing countries to study here in Edinburgh. Additionally, a major focus of EPS will be on outreach and public engagement. The RBGE will play a key role in this and all student members of the network will now have access to engagement through the gardens. Dave Hughes is the Global Head of Technology Scouting from Syngenta, a company whose primary goal is to grow more crops from fewer resources. His talk at the launch focused on the importance of plant science to for global food security. Dave explained that due to the increased popularity of networks in recent years for linking disciplines he believes that EPS will play a vital role in getting people talking who wouldn’t normally meet. “Inspiration and innovation get sparked and I was very happy to be invited to give a talk,” he told me. An important point that was picked up on by many speakers and attendees on the day was the importance of public perception towards new technologies for increasing crop yields. Often, the media and public feel concerned to hear about genetically modified organisms and the use of chemical pesticides. When asked where he thinks this negative propaganda comes from, Dave suggested that often technology doesn’t fit with people’s opinions of how the world “should” be. The public doesn’t like the influence of big businesses such as Syngenta in their lives “taking control of agriculture”. The problem is that the degree of regulation means that smaller companies aren’t able to engage, and thereby get pushed out, leaving only the larger companies. So what does Dave think we can do to encourage the public to be more tolerant? “We need people to realise the benefits”. These benefits are usually only seen by farmers and not the general public. For example, if there is a 10% increase in crop yields, the farmers will directly feel the advantages of this increase; however they will not be felt by the customers when they are buying food in the supermarket. Dave’s conclusion is, “There is an inappropriate fear of technologies that are safer than crossing the road”. A huge thank you to the speakers interviewed for sharing your views with me on the future of EPS and well done to students who took part in the 2 minute thesis competition!